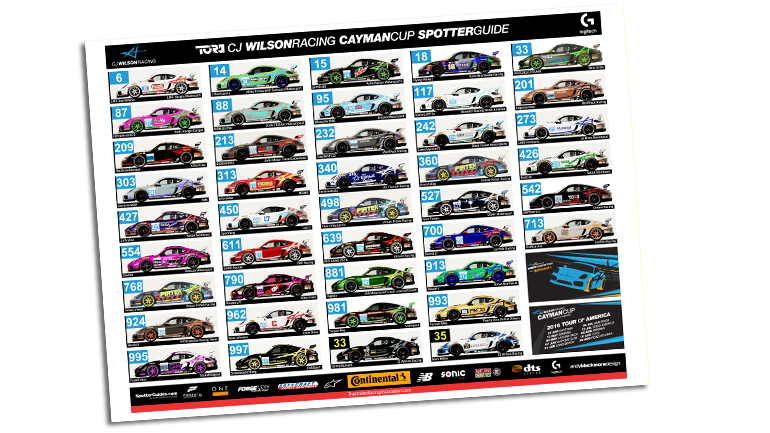 TORA CJ Wilson Racing Cayman Cup Virtual Racing Spotter Guide released. 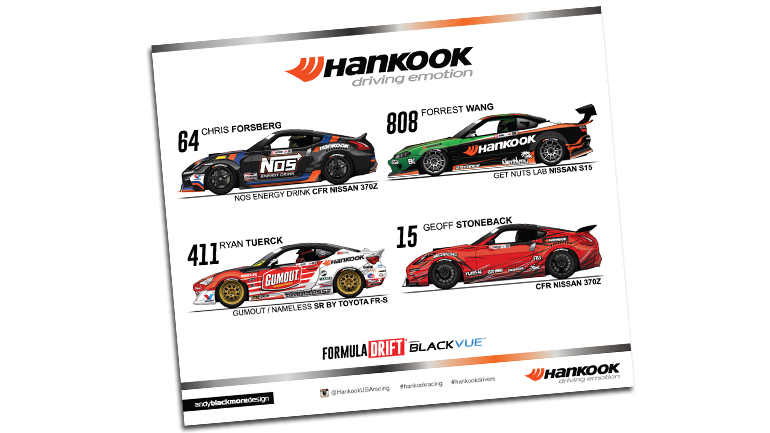 Hankook Tires Formula Drift Spotter Guide launched. Head over to the dedicated Hankook page on SpotterGuides.com to download your guide, or pick up one at the Formula Drift events during 2016. We have deliberately left space for you to get Autographs. 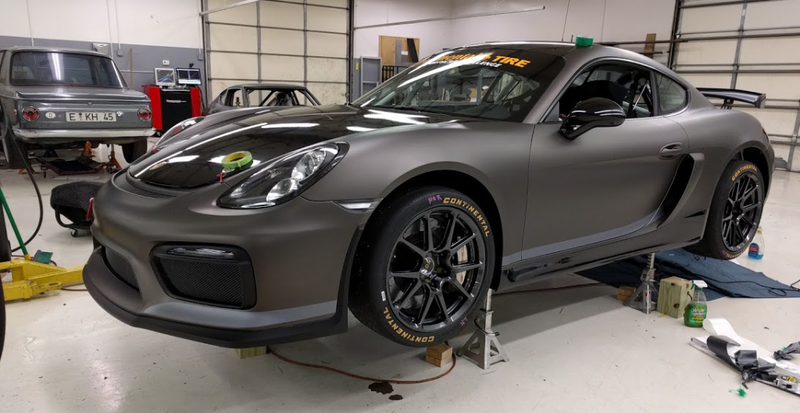 Thanks to Hankook Tires USA for their continued support. 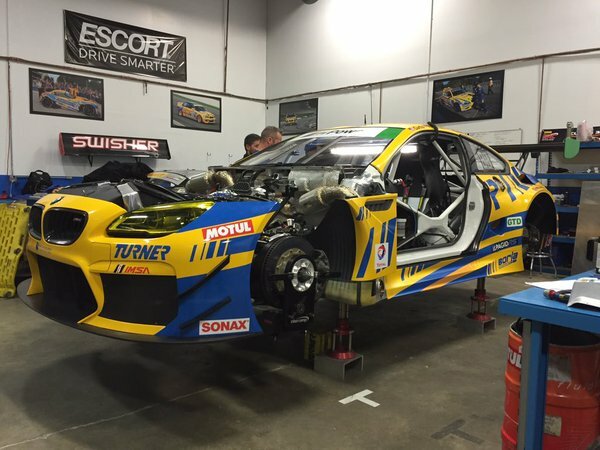 Featuring all the important international racing series, and many domestic ones, this has all the latest schedules as of this week. Prints will be available next week. 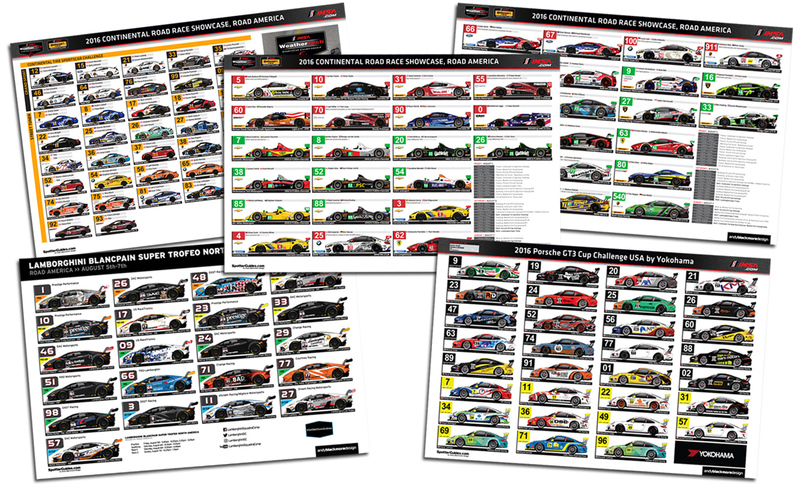 The Official IMSA Spotter Guide features all four TUDOR classes as well as the Continental Tire SportsCar Challenge. You can download the official guide from the dedicated page. 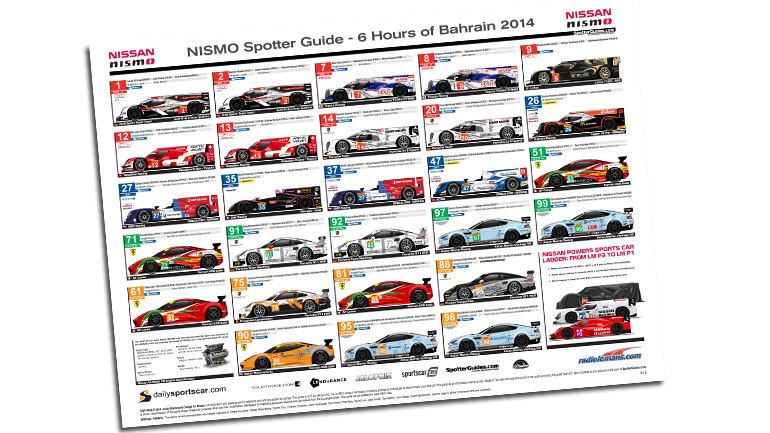 The NISMO Spotter Guide for the WEC round features all 31 cars with the latest liveries and driver changes. 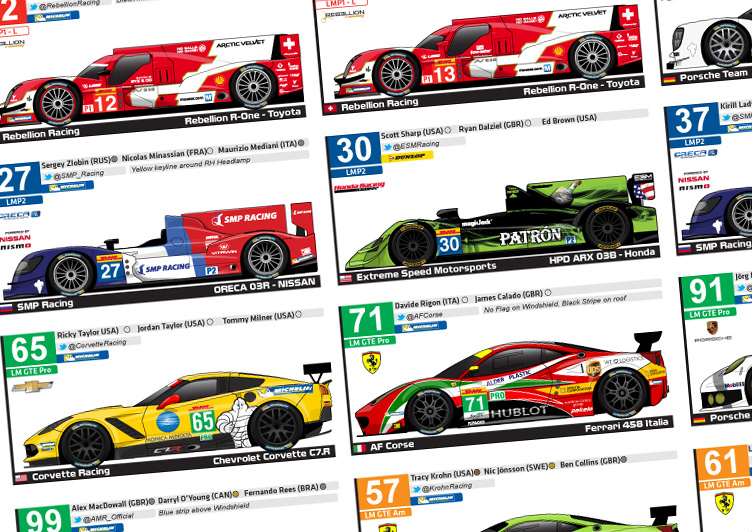 You can download the WEC guide from its dedicated page. 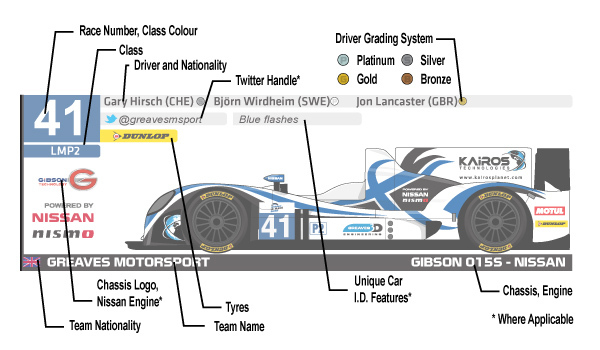 Both guides will be kept up to date during the week with driver and any significant livery changes. Thank you to Nissan and IMSA. Without their support, there would be no Spotter Guides. 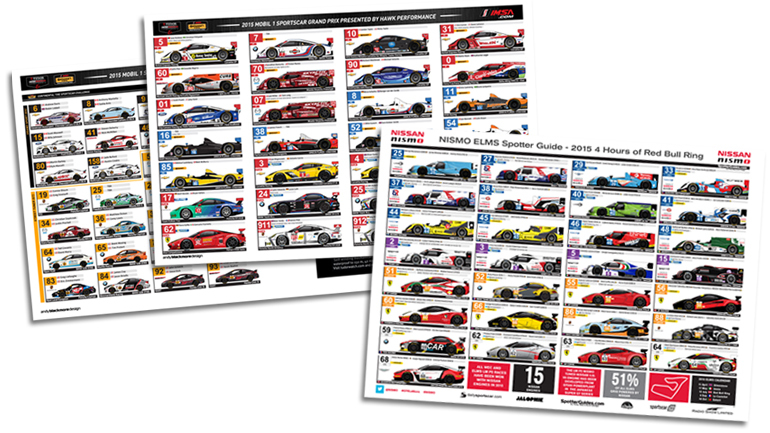 The NISMO European Le Mans Series Spottter Guide for the Red Bull Ring and the Official IMSA Mobil 1 SportsCar Grand Prix Spotter Guide for Canadian Tire Motorsport Park are now available to download at their dedicated pages (see links). 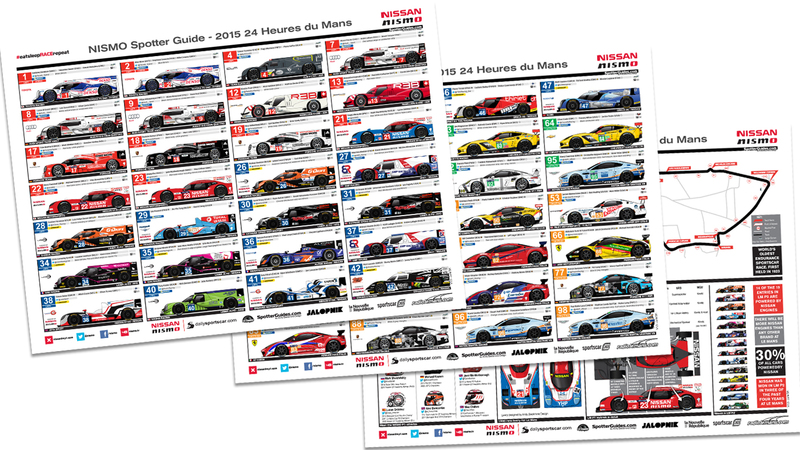 Thank you to those who downloaded, retweeted, shared or liked the NISMO Le Mans Spotter Guide. We had over 100,000 unique downloads on this site, plus an unknown number via Nissan USA’s press release channels.. 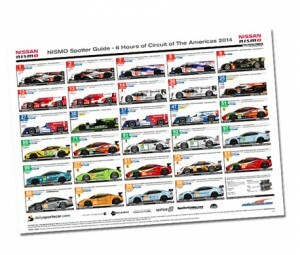 Thanks to Nissan NISMO for sponsorship of the ELMS, WEC and Le Mans Spotter Guides and to IMSA for partnering on their official Guides for the TUDOR and CTSC series. 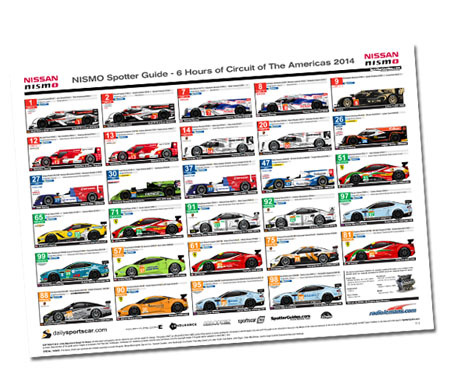 The NISMO Spotter Guide series returns for 2015 in April with expanded coverage starting from Silverstone on associate site SpotterGuides.com. 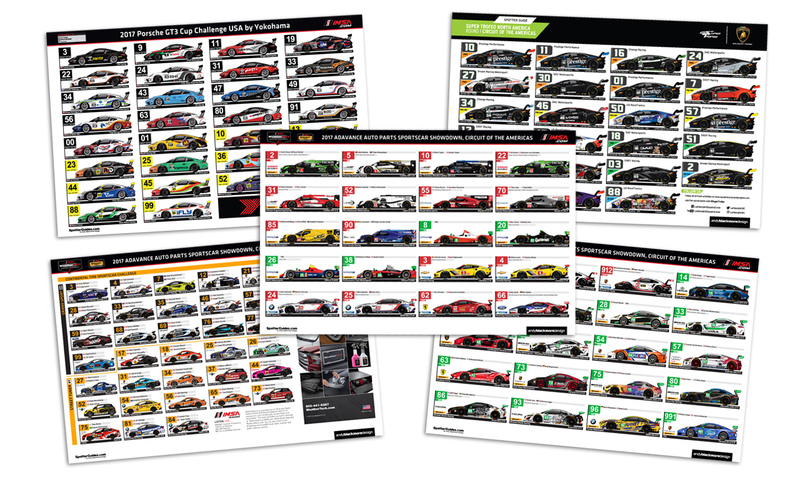 Following a very successful 2014, the World Endurance Championship Spotter Guide will be joined by the European Le Mans Series Spotter Guide for each of the five rounds. For 2015, we are reverting to the traditional 11×17 Landscape Guide online. 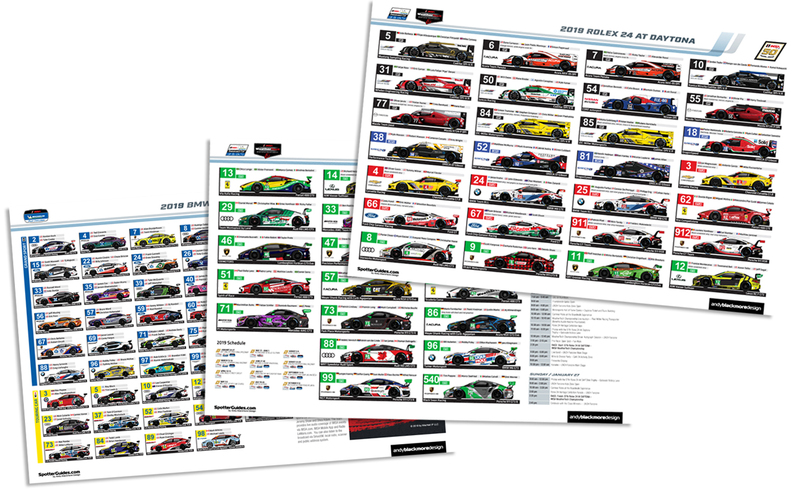 For the larger races this consists of three pages which will feature all the car, team and driver details to all the entries in the TUDOR Championship. 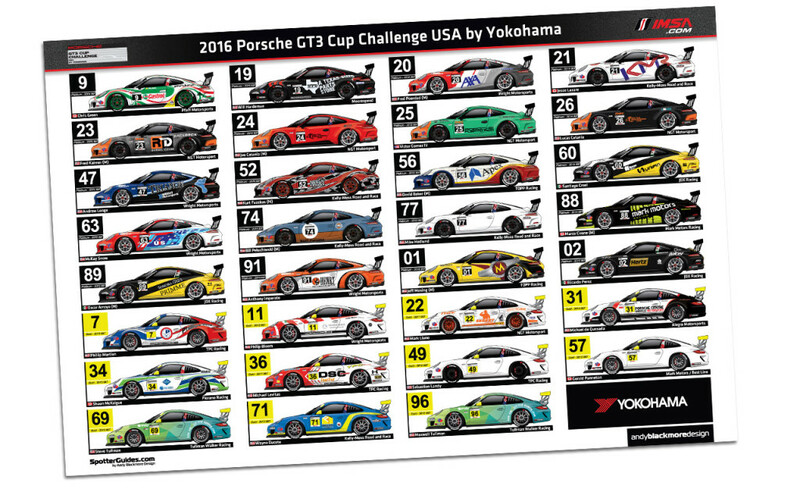 New for 2015, we are also including the leading 40 entries for the Continental Tires SportsCar Challenge. 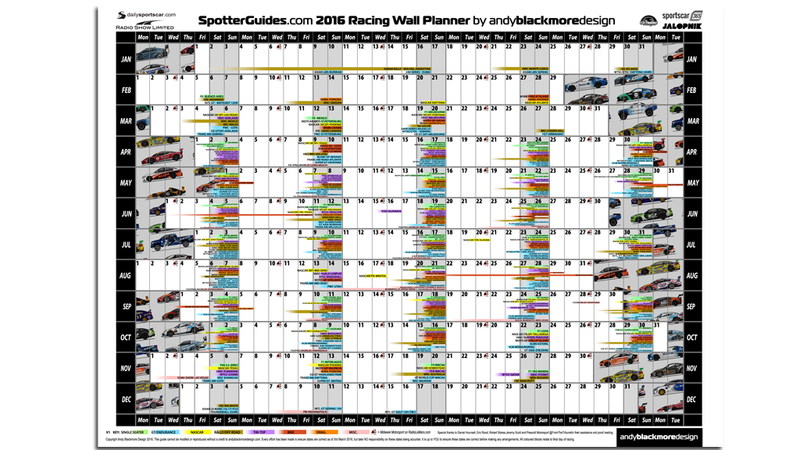 When space allows we will also include the race schedule. The guide will be updated for each race and will be available on the Monday of race week. 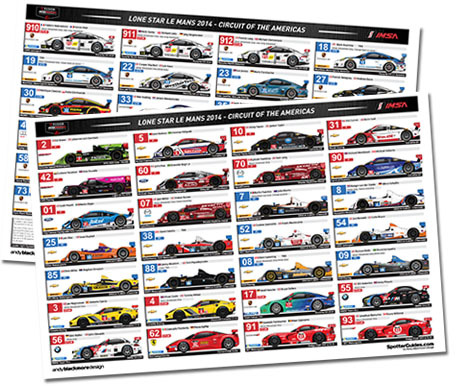 I am excited to announce I will be working with IMSA again in 2015 creating the art for the official IMSA Spotter Guides. 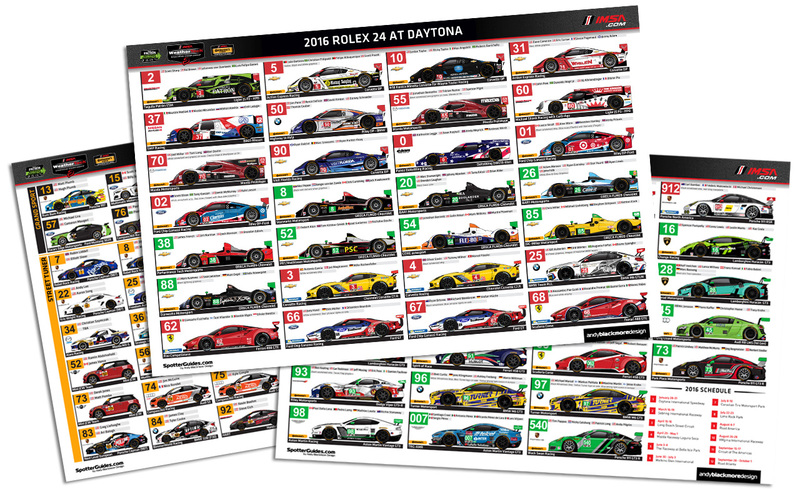 Starting with the Rolex 24, IMSA will print a ‘Race Viewing Guide’ booklet available at the circuit as per 2014. 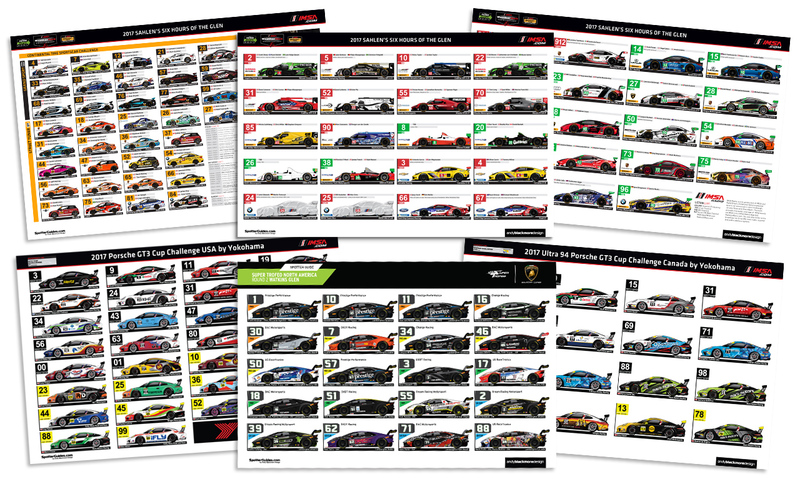 Online, we will be reverting back to the traditional 11×17 Poster Style Guide for you to download which should make things easier! 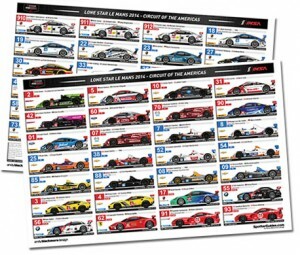 The online guide will be released on spotterguides.com and imsa.com on 19th or 20th January and will be updated during the week as new drivers are announced. 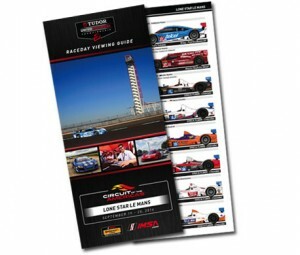 The TUDOR United Sports Car Championship and FIA World Endurance Championship share the bill at The Circuit of the Americas this weekend and SpotterGuides.com have guides to make your experience more enjoyable at home or the track. 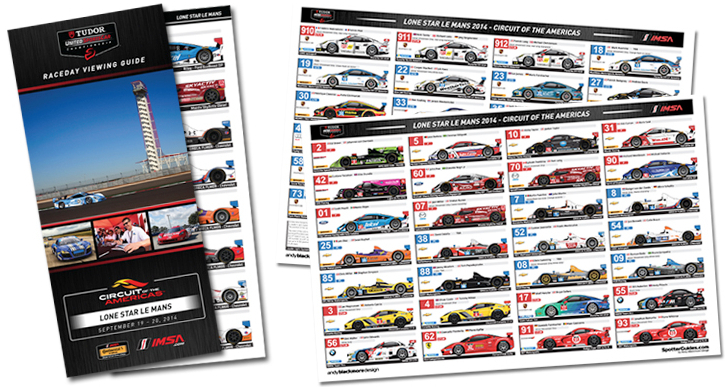 NISMO will be sponsoring the remaining FIA WEC Spotter Guides following the huge success of the 24Hr Le Mans Spotter Guides where we had over 93000 downloads to date. 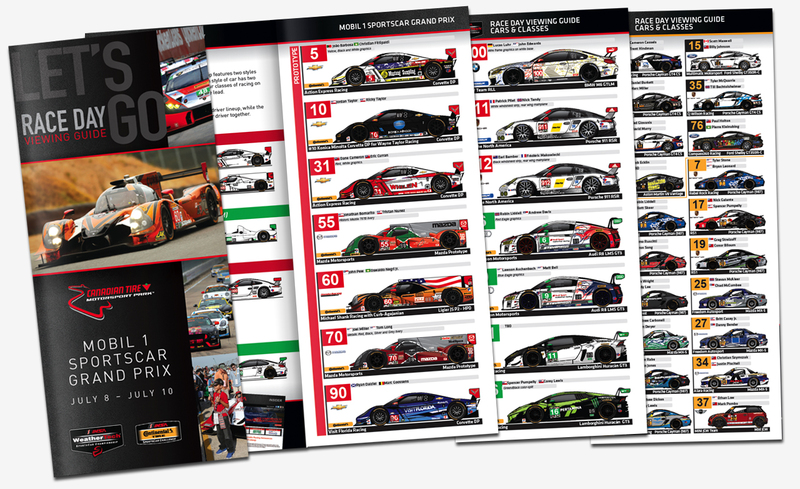 The WEC guide is available here. 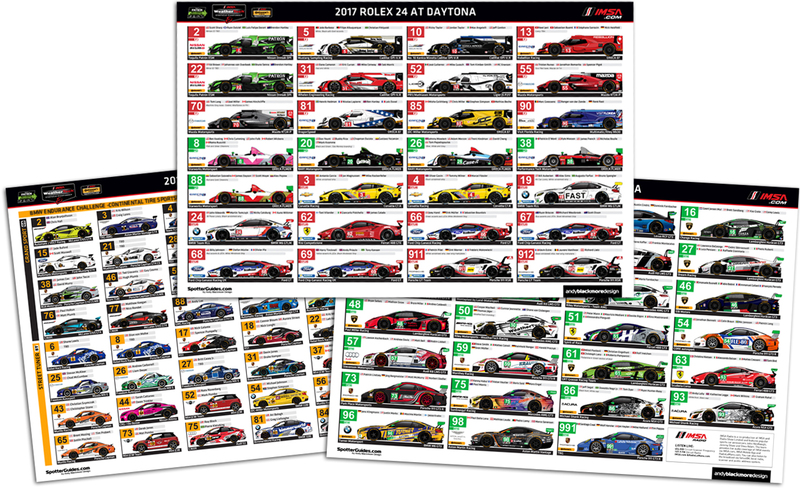 There are two versions of the Spotter Guide available for the IMSA events. 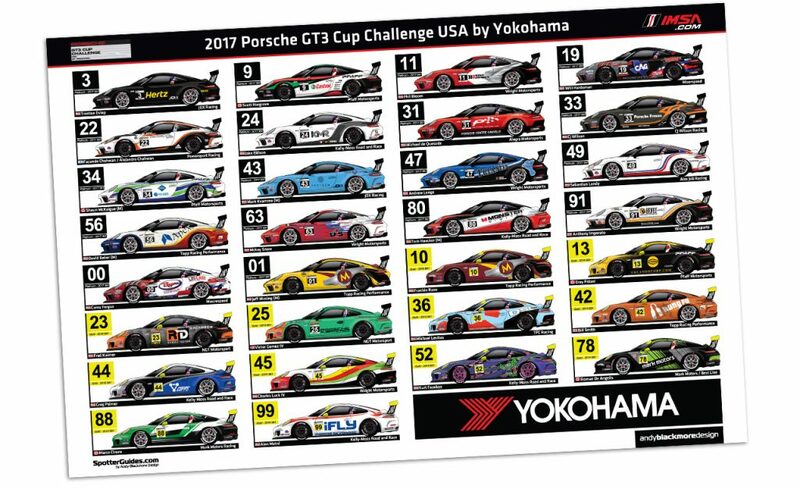 The IMSA Viewing Guide booklet is available to download here, or printed at the circuit, while for CoTA and Petit Le Mans, Andy Blackmore Design will also be releasing a traditional ‘Poster Style’ version of the guides. This is a trial, so let me know what you think below. 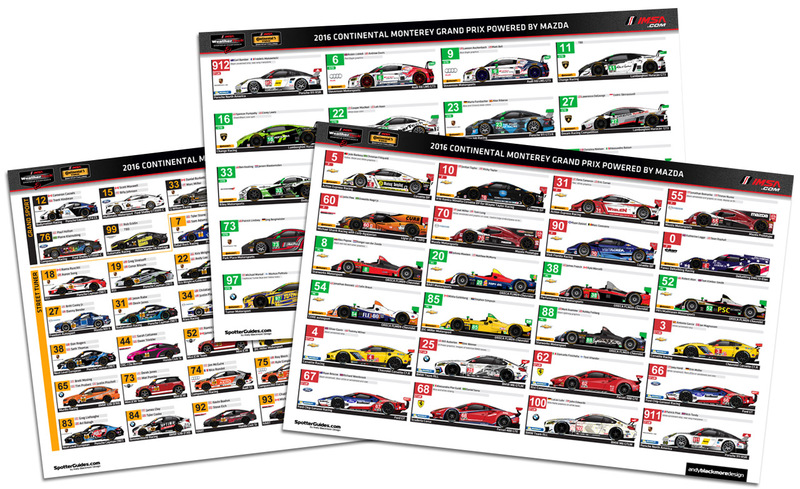 You can download the IMSA guides here.